Salak Shines in First Period at the AHL All-Star Game · Let's Go Amerks! 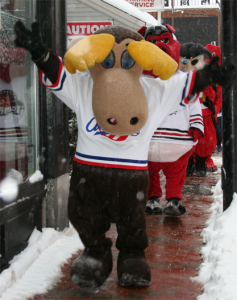 Rochester is well represented at this years AHL All-Star Classic event with Graham Mink, Alexander Salak, Keaton Ellerby and also The Moose! “This is for the fans,” P.K. Subban talked about during an on ice interview to start the game. It is a great event to see the star players from every team around the league. The games can go either way. They can be a snoozefest or an exciting fast paced high scoring event. Either way, it’s a fun time. 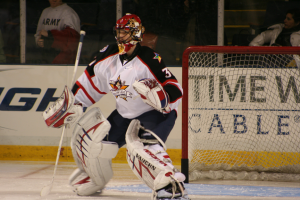 Alexander Salak was the starting goalie for PlanetUSA and only allowed two goals on eight shots. He almost let in a wrap around goal less than 10 seconds into the game which would have been a new AHL record for fastest goal scored. The real highlight for Salak though was his antics. He made three great saves and the crowd acknowledged him with an ovation to which he answered back by waving his glove in the air to the crowd. He was also given credit for an assist on the third goal of the game for PlanetUSA scored by Brett Sterling from the Chicago Wolves. 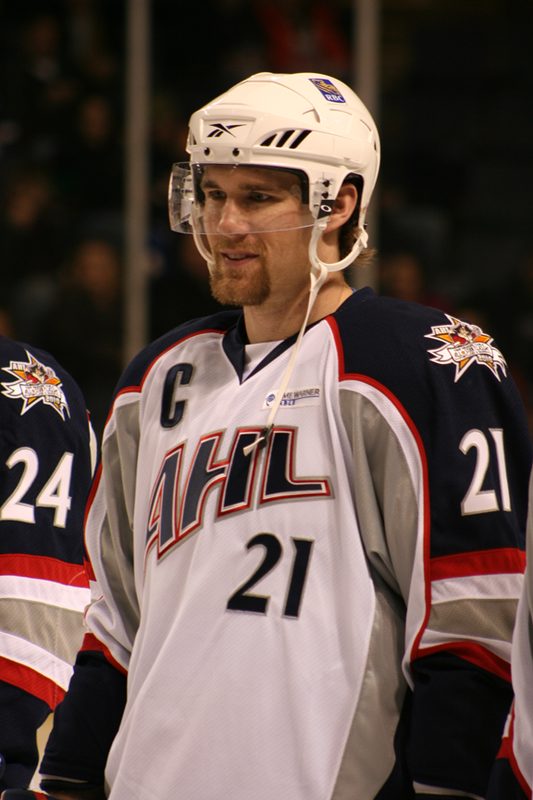 Salak’s assist on the third PlanetUSA goal was just the second assist recorded by a goaltender in AHL All-Star history. Barry Brust was the other goalie with an assist in the 2009 game in Worcester. Later in the period with less than three minutes to go he caught the puck in his glove and as he looked around where to put it he dropped the puck and kicked it about 15 yards down the ice. If there’s someone who knows this is “for the fans” it’s Salak who is having some fun. Graham Mink had a blast during the first period playing against former teammate Alexandre Giroux. The two of them could see tugging and pushing at each other when on the ice at the same time. Mink tallied an assist on PlanetUSA’s first goal of the game scored by Sergei Shirokov of the Manitoba Moose. I think one of the highlights of the event is the mascot game between the first and second periods. The players have a blast seeing each other and hanging out but at least they get to play against each other once in a while. The mascots never see each other so they make the best of things. I talked to The Moose prior to the game and he said he was happy to be here! Later in the game during the third period they had a mascot dance off and T-Bone from the San Antonio Rampage was the clear winner and a new fan favorite. I wonder if the mascots learn a thing or two from each other? Keaton Ellerby finally got an assist late in the third period on a goal by Dustin Jeffrey..
During the second period play Alexander Salak and Cedrick Desjardins were chatting about how close the North Division race is going to be between the Amerks and Bulldogs. Both teams have gone through small slumps and both teams have started playing good hockey again. I have a ton of other audio to go through but there just has not been enough time. I’ll have more in the coming days from Salak, Mink, and Ellerby. Nathan Gerbe is an impressive little player! He scored a goal that was assisted on by Mike Weber half way through the third period. Speaking of Mike Weber, I talked to him for a few minutes prior to the skills competition and he had nothing but good things to say about his time in Rochester. One of the things he mentioned was the tough position Randy Cunneyworth was in that year having to deal with two different NHL teams. It was interest as well talking to Christian Hanson about his game and hockey in the U.S. I wish I had more time to write about the different stories that can be found here with so many different players. We took a TON of pictures and will go through all of them to put online. Portland is a much nicer place to visit than I had expected, even though it hasn’t stopped snowing. With three minutes left to go in the game PlanetUSA is ahead 9-8 in the game. Time to head down to the locker room and get some post game quotes. — Two goals scored by both teams from the start of the game in 1:12. The previous mark was 3:29 in 1996 at Hershey. — With his second goal of the game, Brett Sterling tied an AHL All-Star record with five career AHL All-Star goals. — Salak’s assist mentioned above was only the second ever by a goalie in an All-Star game. — Fastest two goals, one team: Team Canada’s Charles Linglet and Nolan Baumgartner in :13 seconds. The previous record was 14 seconds set in 2003 here in Portland. — Will update later if there was any. If you want more of a recap of the complete game check out www.theahl.com.